I found another zucchini in the garden. All big and plump, it just had to be shredded. 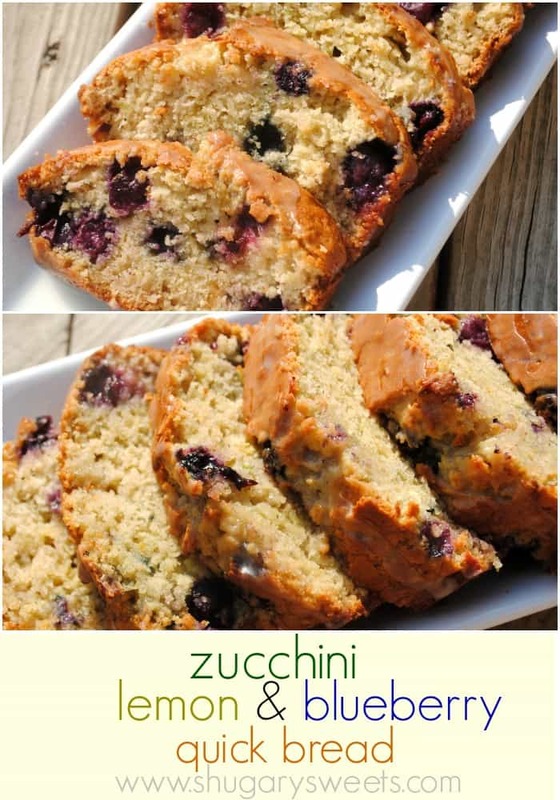 But I’ve made so much bread, muffins, fried stuff…I didn’t think I could eat another zucchini. Then I found a recipe online, and I knew exactly what I was going to do. 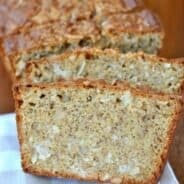 I love blueberries, so for me, it was the right thing to do to add them into this bread. I had to add a little extra baking time, but it turned out beautiful. My only wish was that I should have doubled the recipe, because it was so good. Preheat oven to 350 degrees. 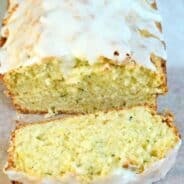 Line a loaf pan with parchment paper, greased. In a large bowl, mix all ingredients (except for blueberries) for bread, stirring to combine. Fold in blueberries. Pour into greased pan and bake for 60 minutes, until completely cooked. Allow to cool for 10 minutes in pan, remove from pan and cool completely. For glaze, whisk together powdered sugar with milk and juice from 1/2 lemon. Drizzle over bread. I enjoyed this bread cold out of the refrigerator! Enjoy! Love , love, love it! I noticed you add lemon zest to this. 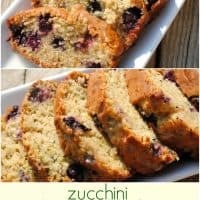 I’ve made zucchini blueberry bread a few times and I like to add orange zest to it. It’s really good. Orange zest is great too!! I will have to give that a try! I just made this and it turned out super yummy! I only changed two things by omitting the nutmeg (preference) and I used an egg-replacer since my son is anaphylactic to eggs. 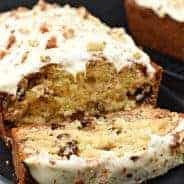 I also used 4 mini loaf pans so I can easily freeze for lunch however I have a feeling it wont last to make it into the freezer 🙂 thanks for sharing. Can you use applesauce as a sugar substitute? I have these in the oven right now! So excited to see how they turn out. Thanks for the recipe! How many servings would you say this should be? Giving this a try today ! Sounds like a great combination!